Firstly I must stress that I am one of the world’s biggest sceptics when it comes to UFO’s, however I can offer no realistic explanation for what I saw, therefore it was literally an unidentified flying object. After exchanging pleasantries via email, I obtained Flt Lt. William’s telephone number and conducted a telephone interview with him in mid December, 2008. Malcolm Williams is going on the record here for the very first time, and he related to me an event that he witnessed on RAF radar while on duty at RAF Lyneham in Wiltshire, England just before Christmas in either 1994 or 1995. 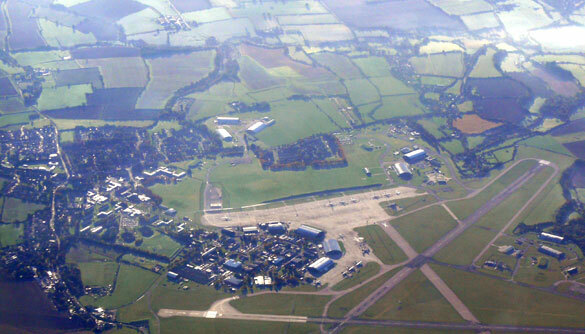 I was working in Air Traffic Control at RAF Lyneham in Wiltshire on a night shift. I can’t remember the exact date but it was just before Christmas in either 1994 or 1995. I was the approach controller and supervisor of the shift. At that time I had almost 20 years experience working on radar and was very used to analysing the quirks that radar can sometimes produce, such as bird activity, anaprop (atmospheric variation) and MTI suppression (Moving Target Indicator). On the night in question, Williams was guiding two C130 Hercules aircraft who were approximately 3 miles from touch down. All of a sudden, Williams observed a very large ‘blob’ on the radar screen. Not knowing what it was, he contacted the pilots of the two Hercules aircraft and fed them around this target. The ‘blob’ seemed to be stationary. Williams passed control of the inbound aircraft to a colleague and went upstairs to the visual control room. The room where he had been based had no windows, so he wanted to see if he could obtain a visual sighting of this radar target. Williams could not see anything but another radar called the DFTI (Distance from Touchdown Indicator) located in the visual control room. It also had this blob on its screen. Williams asked the visual controller if he had any idea what the target was and he replied that he also didn’t know what it was. Williams returned to the radar room and the blob was still on the radar screen. He used the usual suppressors to try and eliminate it, but all to no effect. After puzzling what this image might be for a while, he decided that it must be a technical problem with the radar, but after checking, it all seemed to be functioning correctly. Things took a decidedly different course when the radar blob on the screen suddenly seemed to ‘burst’ and shoot off at tremendous speed in all directions. Williams had never seen anything like it and had never seen anything move so fast in all his life. There was a brief discussion with a colleague, but they had no idea what it was. The visual controller witnessed the same on the DFTI. Not long after this, Williams had a telephone call from a very agitated airman who was on guard duty on the base. Sir I have not been drinking, I am on guard duty and have just seen something that was very strange, but can’t explain, but thought that Air Traffic should be informed of. The airman informed Williams that he had seen a bright light in the east and that it had burst and shot off in all directions at speeds he could not believe. He said he had never seen anything travel so fast and it was definitely not an aircraft. Williams informed the airman that he knew he hadn’t been drinking as he had seen the very same thing on radar. Several minutes later, another airman on guard duty, on the perimeter of the base, also telephoned Williams and reported the same thing. Williams recalls that this made the hairs on the back of his neck stand up. He had been willing to pass the whole episode off as some kind of technical fault with the radar, but now it was obvious that this was not the case. Williams logged the details and telephoned the Ministry of Defence. He reported the incident accordingly. The chap he spoke to at the MoD stated that usually they can explain most sightings, but they took it seriously when someone of his military standing and experience report such things. 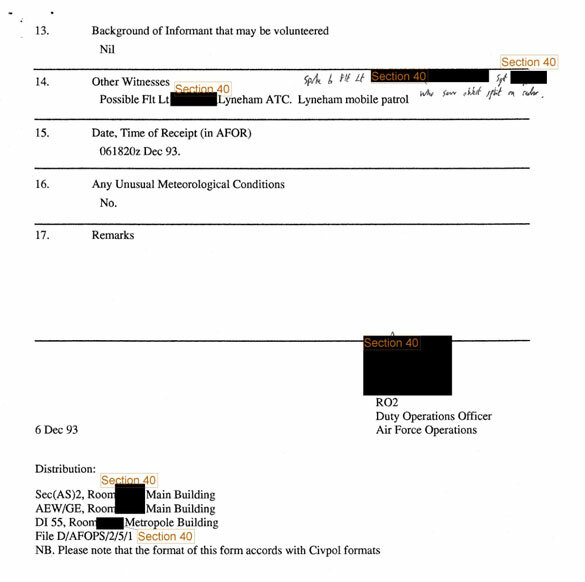 Williams followed this up with a written report that was sent to the MoD in London. Apart from discussing the event with a couple of colleagues and his wife, he had not really discussed it until now. He was prompted to do so by Wing Commander Alan Turner who had previously reported a UFO sighting on radar to me in 2006. 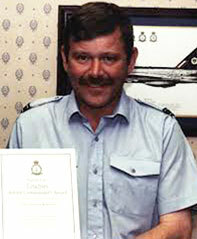 In total, Williams spent 31 years in the Royal Air Force working in Air Traffic Control. In my interview with him in December 2008, he told me that the MoD had never requested the radar tapes of the incident and he received no communication from them after submitting his written report. The events that night have remained in the back of his mind and it has always been a puzzle to him. Williams knows full well what this radar target wasn’t. It wasn’t birds, atmospherics or anything else. It remains a complete mystery to him and that, to him, is an unidentified flying object. This is the first time that Williams has spoken about these events in public and I have recently obtained documents concerning this incident via the National Archives in the UK. 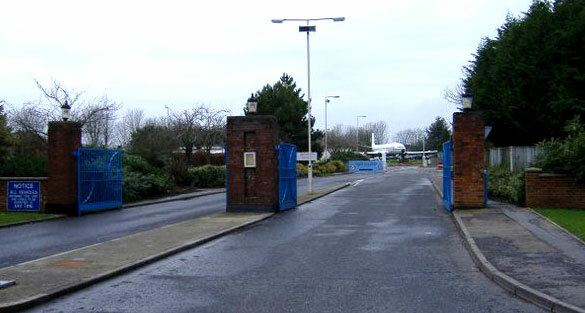 These documents are published here for the first time and relate to the observations made at the time by the security guards at RAF Lyneham. All I can say is that people like Williams should not be ignored and this radar visual UFO sighting is yet another addition to the list of very experienced military officers who have gone on the record to report something that totally mystifies them. It is yet another addition to the wealth of documentation that, despite the best efforts of the debunkers, confirms that there are UFOs. 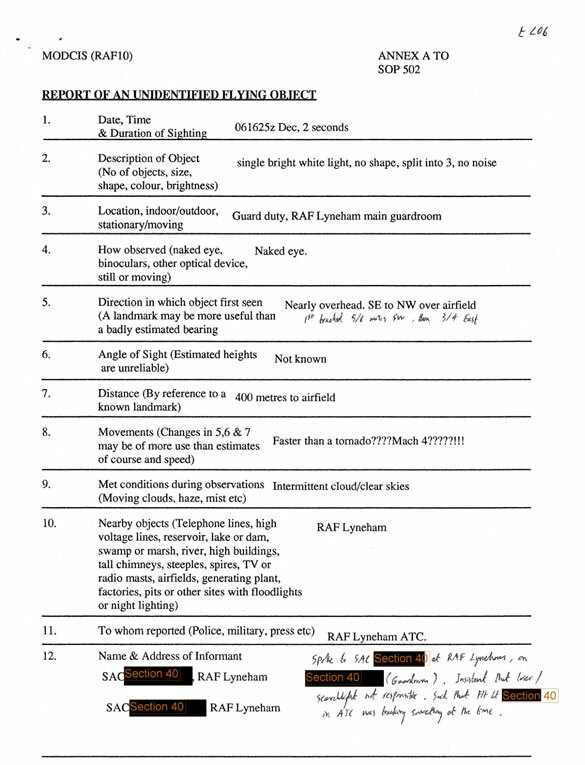 Documents obtained by Phillip Mantle regarding this RAF Lyneham UFO sighting. (Credit: UK National Archives. Philip Mantle is an international UFO researcher, author and publisher at FLYING DISK PRESS. You can contact him at: http://flyingdiskpress.blogspot.co.uk/. I find this sighting report far more credible than others and I am inclined to trust these officers sightings. I now there have also been sightings around this area ofWiltshire before this date. I think wiltshire itself is a very magnetic and ancient county. So it is entirely possible with the air field near by that there could be have been and possibly still is a draw for inquisitive freinds. I have never been so aragont to believe we are the only living things in the heavens. As the saying says. There are more things in heaven and earth than we will ever know.